The Sales Tax Details report provides state, county and city tax details by invoice line item and includes a tax summary with taxable and non-taxable sales totals. The report opens as an Excel worksheet and can be created for a period of up to 31 days. In the Report Area pane, click Sales Analysis, and then click What I Need To Know. In the Report List, click Sales Tax Details. In the Choose Report pane, click Next or press F12. In the Sales Tax Details window, in the Report Settings pane, in the Invoice Date row, specify a date range for 31 days or less. Optional: In the Additional Settings pane, if you want to include line items that are notes, select the Show invoice notes checkbox. In the Sorting Options pane, click Run Report or press F12. In the lower right corner, watch the progress bar, and wait for this message: Report Complete. To see the Sales Tax Details Report, open the downloaded Excel icon in your task bar. Note: If you need tax details to support an audit, contact Paladin Support (800-725-2346 or support@paladinpos.com). The Totals values match the Comparative Revenue report revenue and tax totals. The Total Taxable Sales and Non-Taxable Sales values break down the taxable and non-taxable sale totals for each tax type, and are the sum of individual line items. Each value in the last row is the sum of all taxes collected (State Tax, County Tax and City Tax) and the column’s Total Taxable Sales and Non-Taxable Sales values. The Sales Tax Details report complements the Comparative Revenue report, which calculates taxable and non-taxable values by line item, instead of by invoice. The taxable sales total is the sum of the line items that were taxed. The non-taxable sales total is the sum of the line items that were not taxed. If you click OK or press F8 to continue with the report, a note will appear at the bottom of the spreadsheet, and State, County and City Tax totals will not reflect all sales and may be zero (0). 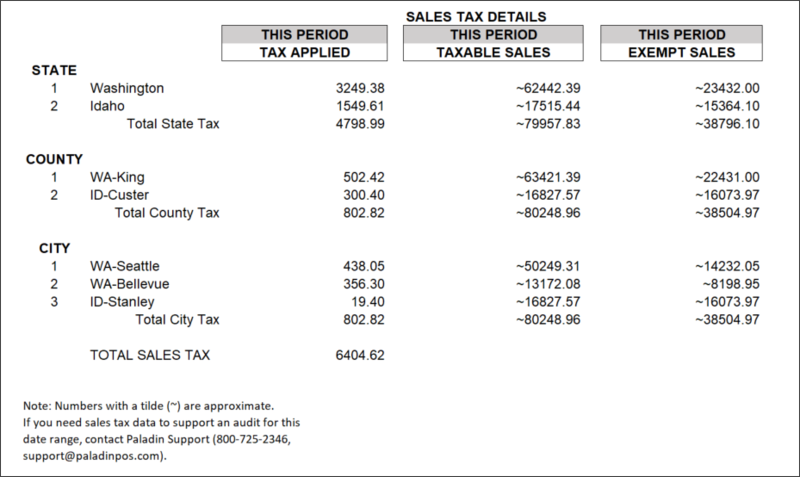 Note: When you run the Comparative Revenue Report, a message appears below the SALES TAX DETAILS table. Paladin Point of Sale will also estimate and itemized sales tax amounts. These estimates will appear with a tilde (~).